Madama Butterfly � An opera in two acts to a libretto by Giuseppe Giacosa and Luigi Illica, based on David Belasco�s play Madama Butterfly. Appendix: A selection of recordings by Toti Dal Monte. 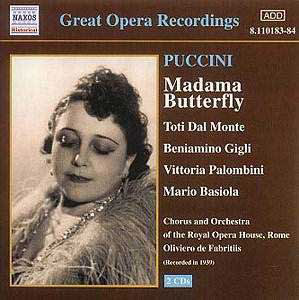 The fourth complete Butterfly was the last pre-war recording of the opera. It dated from July 1939 and is still one of the most convincing. Unlike its predecessors this recording strives for a complex dramatic narration of Cio-Cio-San�s tragedy. Toti Dal Monte�s portrait of the fifteen year old Japanese girl who marries the American Lieutenant B. F. Pinkerton and her naive belief in his love which will finally bring her to suicide, has electrified generations of opera lovers down the decades. This is a legendary recording, which has set standards not only in vocal quality, but also in interpretation. Astonishingly this is the only recording of Beniamino Gigli singing the music of Butterfly. Unlike most of his other operatic roles, from which he recorded at least the main arias in extra sessions, his Pinkerton has only been preserved through the recording sessions of July 1939. He starts with youthful naturalness and brilliance ("Amore o grillo") in the opening scene and with a charming honey-sweet timbre, coloured with the flame of youth and the lyricism of poesy in the great Act One duet with Dal Monte. His "Addio, fiorito asil" is a wonderful example of forceful phrasing and organic legato singing. It arises out of the melody. Gigli, being almost fifty years old, when this recording was made, was still in splendid shape, able to draw a character only with slight variations in the timbre of his voice, from the shades of his mezza voce in Act One to the dynamic outbursts of his gorgeous secure intonation in the last act. Toti Dal Monte�s Butterfly has become famous for her girlish characterisation. Consequently she uses her voice to bring out the naive and innocent side of Cio-Cio-San. Though this is not free of artificial moments, her voice control is nothing less than brilliant. And the stressing of a naturalistic interpretation of Butterfly as a young girl is never at the cost of the beauty of her voice. Butterfly has been, together with Mimi in Puccini�s La Bohème, a milestone in Dal Monte�s career, who had started as a coloratura soprano. From today�s point of view - with experience of the great 20th-century Butterflys like Callas, Tebaldi, Oliviero or Freni - her lyric timbre may seem a bit too light, and her voice is not as profound in the suicide scene as the pathos of the music requires. Her conception of the character comes from another tradition - a turn-of-the-19th-century tradition where the boundary between the �lyric Fach� and the �dramatic Fach� had not yet developed. Accordingly she follows and counteracts the harmonic, timbral and rhythmic elements in the orchestration with the magnificent floating simplicity of her splendid soprano. Interaction instead of dramatic self-representation makes this portrait moving and convincing. Oliviero de Fabritiis and the forces of the Rome Opera House join her in that concept. The orchestra always has equal rights to comment on the love and the tragedy. There is none of the highlighting of drama and passion we are used to from Karajan or Sinopoli. De Fabritiis avoids the pathos wherever possible and emphasises the naturalism of the story. The range from almost impressionistic colours (humming chorus and act two interlude) to harsh dramatic emotions (final scene) is full of surprises. It is to the credit of Ward Marston, one of the most celebrated producers and engineers of historic recordings, that this Naxos set has such a transparent and warm sound. Notably the source for this edition was an RCA Victor shellac pressing, and not the usual HMV counterpart. The outcome is brilliant. This recording has not been over processed, like so many other re-issues today, but has retained its wonderful strong and deep sonic clarity. A slight trace of hiss remains, but does not disturb the joy of hearing this centenary recording. The 2CD set is filled out with eight solo recordings of Toti dal Monte. These date from 1928 to 1941. Considering her popularity she made relatively few recordings, only some 50 all in all. While the three opening arias (from Donizetti and Bellini) present her as the world-famed lyric coloratura soprano from the 1920s and early 1930s, the following two pieces (by Verdi and Mascagni) show her long, lovely, legato lines and her sensitive phrasing. The last three selections (songs by Bianchini and Sadero) illustrate her instinctive musicality and feeling for intimate interpretations. With Toti Del Monte�s art of singing we have documents of the first � unconscious - attempts at a new way of interpretations, away from the art-pour-art bel canto of the 19th century; her Butterfly might be the first recording in this sense.